You get that response sometimes when you admit that you’re a Creationist. The irony is that it was a Creationist rocket scientist, Wernher Von Braun, who got us to the moon. He did it without need of evolution. “For me, the idea of a creation is not conceivable without invoking the necessity of design. One cannot be exposed to the law and order of the universe without concluding that there must be design and purpose. . . . While the admission of a design for the universe ultimately raises the question of a Designer (a subject outside of science), the scientific method does not allow us to exclude data which lead to the conclusion that the universe, life and man are based on design. . . .
Observable, testable, repeatable science has given us many benefits and innovations. Many notable inventions, discoveries and developments are attributed to Bible-believing scientists. Inventions like the telegraph [Morse], mine safety lamp [Davy], electric motor [Ford], galvanometer [Henry], barometer [Pascal] and the reflecting telescope [Newton]. The discovery of scientific of gravity [Newton] and biogenesis [Pasteur]. Louis Pasteur alone gave us pasteurization, immunization and fermentation control. In fact, the Scientific Method itself is attributed to a Bible-believing scientist, Sir Francis Bacon. And no wonder, for the Scientific Method is based on the idea that we have an orderly universe that may be rationally understood because both it and our minds were designed by an Intelligent Creator. Furthermore, we have biblical permission to study the world [Genesis 1:28]. Evolutionists ignore the fact that most of these disciplines were founded well before Darwin or by scientists, like Mendel, Owens and Agassiz, who actually rejected Darwin’s theory! This is true even within the biological sciences! Anatomy, Physiology, Microbiology, Botany, Systematics, Reproductive Biology, Embryology, Comparative Biology, Paleontology, Zoology and Genetics were all established before Darwin or by those who rejected his theory. Creationist Edward Blyth proposed the idea of Natural Selection well before Darwin did. Like Creationists today, Blyth thought of Natural Selection as an observed conservative force that worked against the effects of the Fall to weed out harmful mutations while aiding survival by allowing them to adaptations within the limits of their kind. Darwin’s natural selection, by contrast, was an unobserved creative force that facilitated molecules-to-man evolution. Creationists today continue to practice normal, experimental science without need of evolution. In fact, when evolutionism is conflated with science, science stalls. For generations, our appendixes and tonsils were summarily removed under the false evolutionary notion that there was such a thing as a vestigial organ. Nearly all alleged vestigial organs have now been shown to have a function. 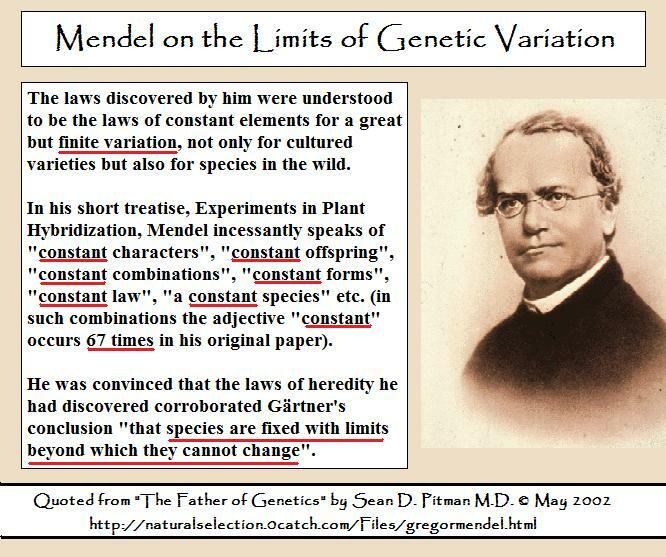 The genetic discoveries of Gregor Mendel were largely ignored for decades because it was considered a waste of time to study varfiation in light of Darwin’s assertions. One of the main reasons Mendel’s work in heredity was ignored was because it suggested that species could changed, but had fixed limits – a notion that Creationists call variation within created kinds – not molecules-to-man evolutionism. “This situation, where scientific men rally to the defense of a doctrine they are unable to define scientifically, much less demonstrate with scientific rigor, attempting to maintain its credit with the public by the suppression of criticism and the elimination of difficulties, is abnormal and unwise in science.”-Prof. W.R. Thompson, F.R.S., “Introduction” to Darwin’s Origin of the Species, J.M. Dent and Sons, 1956. This warning stands prophetic, for it is just as applicable today as it was 53 years ago. Evolutionism is bad for science. In the words of many of its proponents, it is a position assumed by faith because the only viable alternative is Special Creation. Despite allegations to the contrary, it is Creationism that is consistently scientific while evolution is sustained by dogmatic faith, suppression of dissent, credentialism, propaganda and indoctrination through government monopoly schools. Along with proponents of Intelligent Design, we’d like to follow the evidence where it leads. Evolutionists don’t like where it’s leading. If our children are to have a proper understanding of science, evolutionism mortal flaws must be published. Evolutionism must be placed critically under the microscope instead of being carefully guarded from criticism by a High Wall of Protection. Evolutionism must be held to the same standards as any other theory – even if it means evolutionism must die so that true science may advance. ← Is Creationism a Side Issue?